July 27th, 2011 by Margie B. in Tips and Tricks. Welcome to the Burger Shop 2 Tips and Tricks! Please enjoy our handy dandy Burger Shop 2 Tips and Tricks with insightful help and annotated screenshots from actual gameplay! 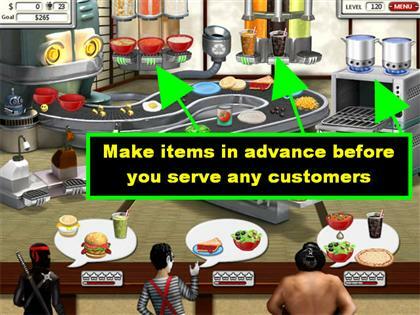 WALKTHROUGH MENUThese tips & tricks were created by Margie B.
Burger Shop 2 has eight locations with 15 levels each for a total of 120 levels. The game also features four different modes for your playing enjoyment. There is no timer in the game, but you still have to get your orders completed in a timely manner or your customers will get angry and leave. You will start the game in Story Mode; after you complete the first 16 levels, Challenge and Relax Mode will be unlocked. Expert Mode will only be unlocked once you complete the 120 levels in Story Mode. In Story Mode new menu items will be added at the beginning of each level. You choose the recipes you want to make in each level. New customers are added as you progress through the game. There will be new customers added to the game even in the last location. In Challenge Mode your game gets harder in one minute increments. Your challenge is to see how far you can get without losing a customer. As soon as you lose a customer, the game will end. In Relax Mode you can choose which types of foods you would like to make. The people lose patience at a much slower pace, but they will never get angry and leave no matter how long they have to wait. This is a good mode to play if you want to get the hang of making certain recipes. You can only unlock Expert Mode once you’ve completed all the levels in the Story Mode. 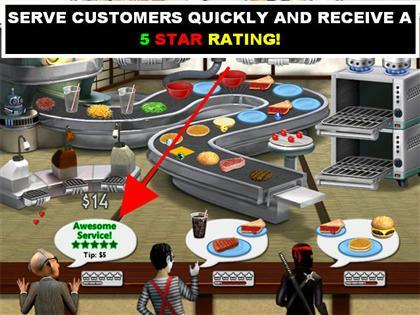 In Expert Mode you will play with all the upgrades and all the available recipes. You must meet your daily goals before advancing to the next level. There are 120 trophies in the game; you can view them by going to the Hall of Fame in the main menu. Scroll through each trophy to see what you need to do in order to obtain them. To deliver and cook orders faster, right-click your mouse; the food will be automatically delivered to the right machine. When you right-click an order to be delivered, the first person that asked for that item will get that item. 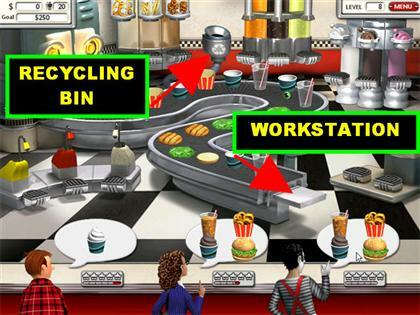 If you make an incorrect order, you can throw it in the recycling bin or place it on the workstation at the end of the conveyor belt. You can also put an incorrect item back on the conveyor belt, if there’s an empty spot. You can assemble the food for the customer in any order you choose. As long as the order has the right ingredients, the customer will accept it. You can click on the space bar of your keyboard to pause the game. You can also pause the game by clicking on the menu tab in the upper right corner. In order to get a perfect rating, your customers must leave the store with a rating of five stars. If Burger Bot is activated at the end of a level, he will still be activated once you reach the next level. You can change your upgrades and menu items by going back to the main menu and choosing an earlier level. Keep in mind that when you do this, the game resets your progress back to that point. Choose the “Change Menu” option to use this feature. You can look at the story that is given at the beginning of each level from the main map. Simply click on one of the buildings on the map and you will be able to read the story again. 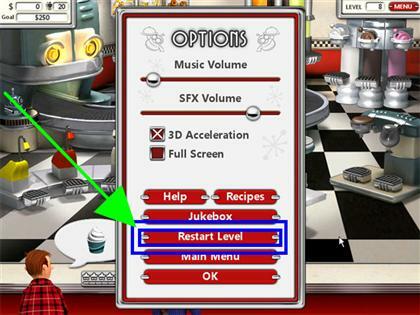 You can restart a level by going to the main menu and choosing the “Restart Level” tab. This will give you a chance to restart the game if you feel you are about to lose, or if you just want a better score. At the end of each level you will be given a breakdown of how you performed. At the bottom of the screen you can see what type of customers and how many customers you’ve served at the end of that level. The customers will be sorted by the rating of the service they received. It will also tell you how many customers you lost according to customer type. This screen will also show you how much money you earned in sales, tips, and bonuses. You can always improve your tip money by serving customers faster. At the end of certain levels you will be able to see what your ranking is. You will start as a “Burger Shop Mopper” and will work your way up the Burger Shop ladder. In order to save time, you can swap out one completed item out of the machine with an empty container. For example, place a cup on the soda machine; as soon as the glass is full, pick up an empty glass and left-click it onto the full glass. The full glass will be on your cursor and the empty glass will start filling with soda automatically. Right-click the full glass on your cursor and it will go to the first person who ordered that soda. If you wait to serve one customer all of their items before you serve someone else, several people will lose patience at once. If you have several customers that are ordering a lot of items at once, serve each of them one of their items, and they will stay happier longer. 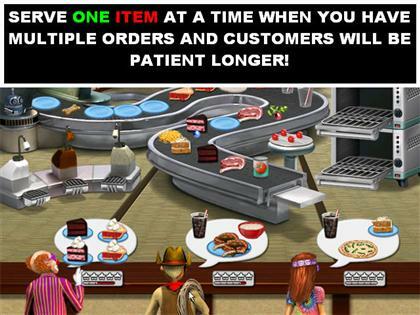 Each item you serve a customer increases their patience level. Prepare items in advance so you can save time and get things done faster. 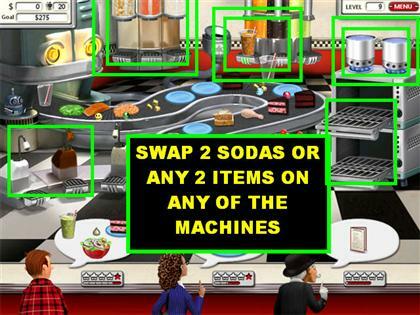 At the beginning of each level, fill the soda machine with one of each flavor. You can prepare the cereal bowls, ice cream, and items that need to go in the pot, ahead of time. When you prepare things ahead of time, it will help you get through the parts of a level that have customers asking for three or four items in one sitting. Happy customers equal bigger tips. Make sure that your customers leave the shop as happy as possible so they can leave you a bigger tip. To get the maximum tip from every customer, you have to make sure they leave with five silver stars. Each star that they lose while waiting for their order costs you tips. To get a five star rating from a customer, make sure you serve them quickly. You can also give them lollipops to increase their happiness level. Give them the lollipops right before you serve them their last item, to keep their stars as high as possible. Right-click as much as possible to send your items to the desired station, this will make the game go faster for you since you do not have to drag an item to a specific person or station. Keep in mind that you cannot right-click on items like the potato, since they can either go in the pot or in the oven. Pick up two items at a time so you can cut down your cooking time. For example, you can click on two waffles and they will both be on your cursor, right-click them and both pieces will go into the toaster. You can also pick up two items at one time and put them on the plate. For example, you just grilled two steaks in the oven, if the order goes to the same person, you can pick up both pieces at once and place them on a plate; right-click on the plate to deliver it to a customer. Develop a system in your mind that will help you assemble complex recipes in an organized fashion. When making triple cheeseburgers, you may want to collect all the burgers first and then the cheese. If you try to alternate ingredients, you may get confused and make it incorrectly. You can still salvage a customer that is about to leave the scene. As soon as you see them dipping down low to leave the shop, send them an item before they disappear. If you catch them on time, they will surface back to the top and pay you for their food. There are eight power-ups in the game; each power-up can help make things smoother in the game for you. You can look in the main menu for the picture of each power-up and a brief explanation of what they each do. Below, we will give you additional tips on the best way to use these power-ups. The power-ups will only show up for a short amount of time. In order for them to be effective, you have to deliver the item they are attached to before the power-up disappears. The power-ups will each have a different color and icon. Make sure that you familiarize yourself with the different types so you can use them in the areas that you need help with most at the time. When a power-up starts flashing, it means that it is about to disappear. Make sure that you use a flashing power-up on an item that only requires one step to make. Preferably, it should be an item that is on the conveyor belt and does not require cooking or to be mixed with another item. 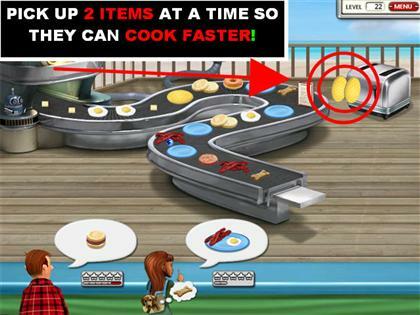 Use non-flashing power-ups on a complex recipe, since you have extra time to prepare it. Try to pack several power-ups into one recipe. For example, you could build a triple cheeseburger with each ingredient having a different power-up attached to it. As soon as you deliver it, all those power-ups will go into effect at once. You could also use multiple power-ups on plates that have several items piled up on them at once, like eggs, pancakes, steaks or dinner rolls. The speed power-up is one of the best ones available. When you use it, it makes all the equipment in the shop run faster. When the speed power-up is activated, take advantage of it by only making orders that need the use of a machinery to make. You want to concentrate on items that have to be in the toaster, the oven, or any machine that dispenses cereals, soups, sauces, and beverages. 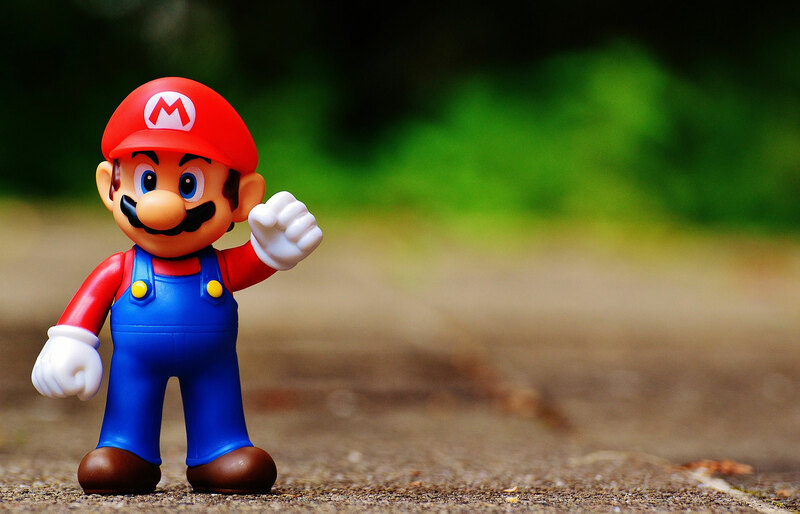 Use the happy power-up on customers who have a low happiness level and this power-up will restore them back to full. There are a lot of recipes in the game; some require boiling, broiling, sauces and creams. You will be shown the recipe for a new item at the beginning of a level. Pay attention to the recipes as they are shown to you so you don’t waste too much time figuring things out in the middle of a level. You can always review all the unlocked recipes on the options menu in the main menu. If a recipe requires you to add more than one item in a pot, like peas and carrots, then cook them both at the same time. In order to cook them at the same time, pick them both up on your cursor and right-click on them. The peas and carrots will automatically go into the same pot and will save you from tying up two pots for the same recipe. If you have to make a pizza with toppings, you can make the pizza in the oven and add the ingredients after it is cooked. I would recommend adding all the toppings at once before you place them in the oven, so you can deliver it faster to the customer once it is done. Burger Bot is an upgrade that will help you prepare orders for customers. Burger Bot is activated by the tips that you receive from the customers. The faster you accumulate tips, the faster he will be available. There are two upgrades available for Burger Bot. Burger Bot 1.0 will automatically prepare an order for a customer of your choosing. As soon as Burger Bot is activated, drag him to a customer, and he will deliver the complete meal to them. Burger Bot 2.0 will deliver one item for each customer present at the shop. 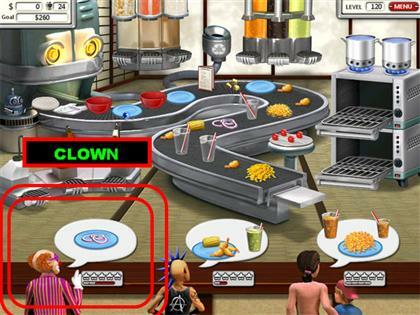 In order to activate this feature, you have to click on the blue button that is at Burger Bot’s station, or you can simply right-click on him. When using Burger Bot 2.0 keep in mind that he will automatically make the first item in a customer’s order. In order to take full advantage of the 2.0 feature make sure that you let him prepare a complex order instead of a simple one. For example, if a customer has a soda as their first item and a triple cheeseburger as their second item, hand them the soda first. Get all the simple orders out of the way first and then send Burger Bot 2.0 to do the harder recipes. This method will save you the time of having to make recipes that require multiple steps. The money power-up allows you to charge the Burger Bot faster, since it adds $20 to your total. As soon as you see the money power-up appear, try to use it on an order as soon as possible. 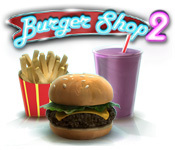 Burger Shop 2 has added five new customer types since the original Burger Shop game. 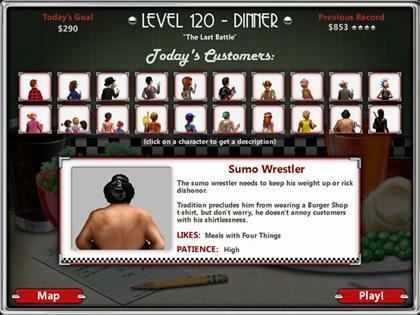 There are 20 different types of customers in Burger Shop 2, each with their own temperament and tastes. Once you know your customers, you can plan the best way to serve them. It’s important to know each customer’s quirks because it will allow you to pick and choose who gets served first. You want to serve the most impatient people first for two reasons: they pay bigger tips; and they lose patience very quickly. If you wait too long to serve them, they will get angry and leave the establishment without spending any money. You can look at a customer’s patience bars that are located at the bottom of their bubbles. The shorter the bar is, the more impatient that person will be. You can read a full description of each customer type by clicking on them when they are shown to you at the beginning of a level. For the purposes of this guide we will just go over the customers that require the most attention. When the Shirtless Guy comes into the shop, the people around him will lose patience at an alarming rate until he puts on a t-shirt. As soon as you see him in the shop, right-click on a t-shirt on the conveyor belt and he will automatically put on a shirt. You will see the customers around him regain their patience level immediately. The Punk has a very low patience threshold; make sure that you take care of him above the majority of the other customers, or he will get angry and leave. 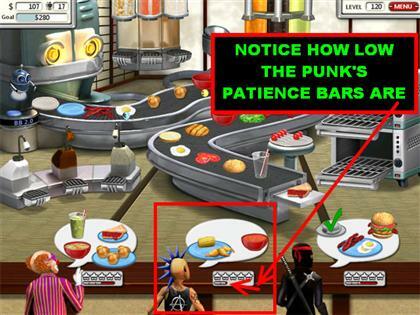 You will notice that the Punk comes in with a smaller patience bar than most of the customers. 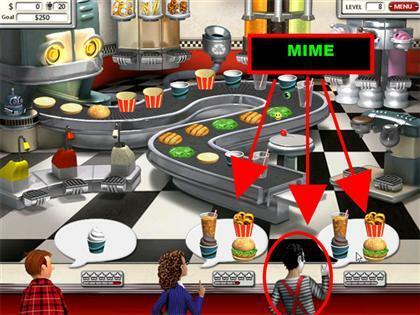 The Mime will come into the shop and order the same thing as the last person who entered the shop. As soon as you see him come in, you can prepare his meal ahead of time. The Schoolgirls always come in and order items in threes. They usually order three of the same types of drinks or fried foods. 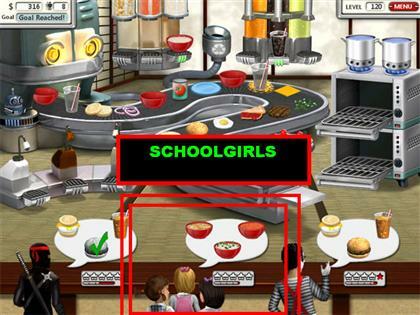 On other types of foods, they will order three of the same item, but with different toppings. If they order ice cream, they will order one of each flavor all with different toppings. If they order soup, they will have one of each flavor with different toppings. When they are ordering ice cream, just grab three ice cream cups and place them under a different flavor. Then, just add the toppings they want and serve it to them. The Dog Lover will come into the shop with a dog and a small amount of patience. As soon as she comes in, make sure you give her dog a bone; she will then be in a better mood. The Clown is the funniest of all the customers. He will come in and ask for the oddest items. He could ask you for some powdered sugar with just butter on a plate. He may even ask you for an empty French fry container with just ketchup added. Sometimes he will just ask for a plate with only parsley or onions on it.